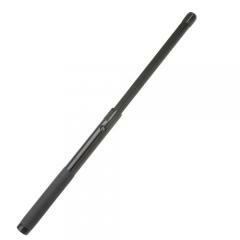 The MX series police batons feature a positve lock system and epoxy coated aluminum tube shaft. They open with the same high cracking sound as friction lock batons but lock open with a push button pin mechanism rather than friction; it cannot collapse until you want it to. Open it with a flick of the wrist or when needed gently pull the shaft quietly and smoothly. You don't have to swing the Monadnock MX21 baton like other models. To close, simply push the locking pin down and then push the shaft in from the tip. No more banging on the floor! Love the way you can open and close it with your hand. Don't have to bang it on a hard surface to close it. What is the length when closed?